Soft cottage cheese(Paneer) pieces dunked in thick n rich n creamy tomato gravy,Paneer lovers will make a beeline for this dish. 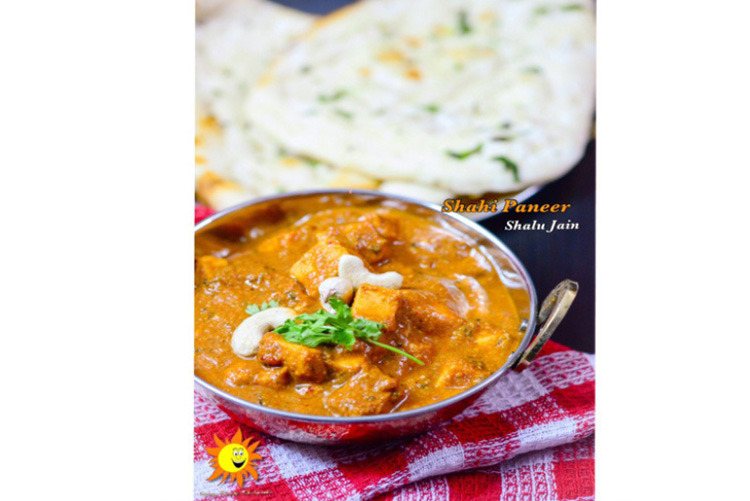 This shahi paneer recipe is perfect for a dinner party and would leave your guests craving for more so make sure you have sufficient quantities tucked away in the kitchen. This shahi paneer recipe uses cashew nut based tomato gravy to bring in the rich texture and flavor.This is my version of making it. It is without onion n garlic. Combine all the ingredients along with 1cup of water in a wok/Pan and boil on a high flame for 10 to 15 minutes or till the tomatoes ar soft, while stirring occasionally. Add the Ginger powder, hing, cinnamon, cloves, cardamom and bayleaf and sauté on a medium flame for a few more seconds. Add the dried fenugreek leaves, tomato purée and red gravy and sauté on a medium flame for another 2 to 3 minutes, while stirring continuously. Add the curd, mix well and cook on a medium flame for 1 more minute. Add the sugar. N 1/4 cup of water, paneer and Salt n mix well and cook on a medium flame for another 5-10 minutes. Serve hot with Roti,Chapati,Poori,Paratha or Rice.